Creating new users on your WordPress website is useful if you ever need someone else to work on your website. Creating a new account gives you the flexibility to remove it when it’s no longer needed, and doesn’t then require you to give this person your password. And of course, creating a new account is necessary if you ever want to have other people write for your blog. It can also come in handy for a few security purposes, such as publishing posts using a non-Adminstrator account. So to learn how to create new users on your WordPress blog, keep reading. Select Users > Add New from the main menu in the WordPress admin. Enter information about the new user account. Make sure to choose a strong password (one that contains uppercase and lowercase letters, numbers, and special characters). 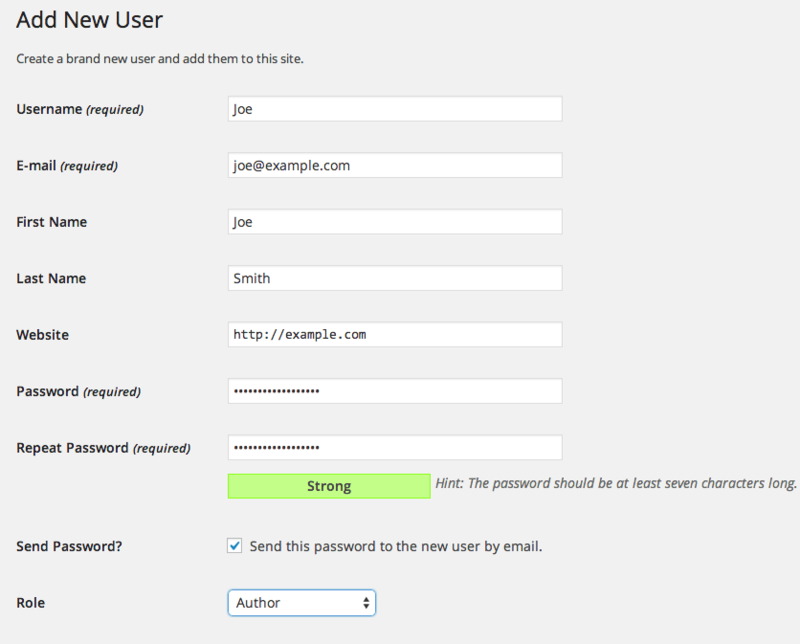 The strength of the password displays below the text input fields where you type it. Select the appropriate user role for the new user. If they are only going to write articles, choose Author or Contributor. If they are a web designer or developer helping you build or change your website, they will need an Administrator role. Click Add New User to create the new account. Click this to create the new account, and optionally send an email to the new user. If you selected the option to send the new user an email, it will send at this time. The message contains the new users’ login credentials (username and password).